Southampton manager Mauricio Pochettino says the club has no issue with Mark Clattenburg refereeing their match at West Ham United on Saturday. 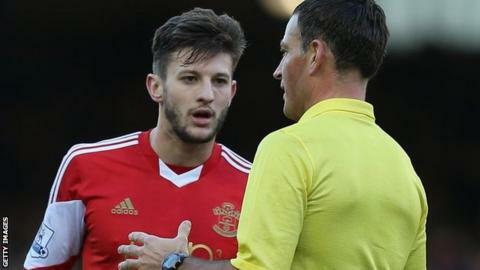 Last December, Saints lodged an official complaint after accusing Clattenburg of insulting midfielder and captain Adam Lallana. The club reacted angrily when the Premier League rejected the complaint. But Pochettino told BBC Radio Solent: "We want to make clear there is no negative feeling over what happened." The Argentine continued: "We're very happy that he's refereeing the game. "We need to find tranquillity after what's happened in the past. "These things can happen in football. Referees can make mistakes and we need to help them and try and make his difficult job as easy as possible. "Everyone needs to learn how to react in certain situations. Refereeing is a very tough job. It's always clear mistakes can happen and everyone needs to understand that." The incident occurred during Southampton's 2-1 defeat at Everton after Lallana challenged Clattenburg's decision not give a penalty. It is believed the County Durham official told Lallana: "You're very different now you've played for England. You never used to be like this." Meanwhile, Pochettino has also given his first reaction to the widespread criticism he received for making six changes to his side which got knocked out the FA Cup at Sunderland last week. Assistant Jesus Perez faced the media after the 1-0 defeat. "We accept the sporting criticism - we had a bad day, although we did create many chances. "But we don't accept the other criticism, we think it was a bit out of balance," Pochettino said. "In the time we've been here we've shown full respect to every competition - especially the FA Cup. "We've always played with the best team that can actually win the game and that's what we did on Saturday. It just wasn't our day and that's it. "It's a bit rich we get criticised when, since we've arrived, we've used many young players. We've given young talent the chance to grow and mature within the team. "For example, against Arsenal we played [18-year-old striker] Sam Gallagher from the start and no-one said we had no respect for the Premier League. "I find it completely contradictory. "We want to be an important team in the Premier League, that's our main concern, but the cups are very important for us because they are a chance to win some silverware. "In the future, with a bit more development, we'll be aspiring to win those competitions."